An easy and convenient way to cross a 10 lane motorway. 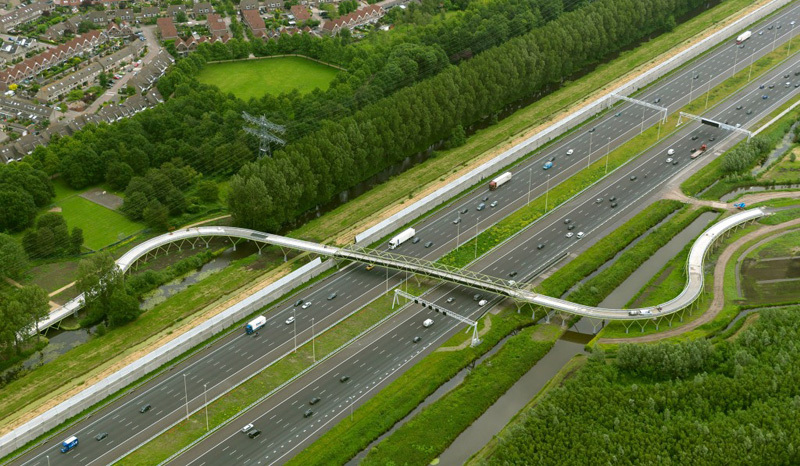 That is what the cycle bridge in the recreational cycle route Rijnveldsche Pad was meant to be. It makes it possible for people from Maarssen to get across the recently widened motorway A2 (from Utrecht to Amsterdam) to reach the newly developed recreational area at Haarzuilens. The cycle bridge in the Rijnveldsche Pad at Maarssen. This part of the A2 motorway, from Utrecht to Amsterdam is one of the oldest freeways in the country. Construction started in the 1930s, but the building activities were stopped in 1942 because of World War II. After the war this road was the first big new 2 x 2 lane road to be finished in 1954. By 1976 it had already been widened to 2 x 3 lanes and from 2008 to 2011 it was to be widened to 2 x 4 lanes, but then again to 2 x 5 lanes in 2011. To compensate the negative effects of that extra last minute widening the cycle bridge was built. It was an integral part of that widening project. The aerial picture shows just how wide the A2 motorway has become. The houses of Maarssen can be seen top left. Picture courtesy of the blog “De Bak”. The bridge is excellent to take people to the recreational area around Haarzuilens (which has a lovely castle as well). It forms a part of the long distance recreational cycle network in this area. The curved entrances lead people up to the motorway and right through the sound wall. The design of the bridge then encloses the people who use it while leading them across the busy motorway. At the other end it then opens up again, the same way the landscape opens up to them again. That is how the architect of the bridge, Aletta van Aalst, describes it. The sides of the bridge have perforated aluminium fences. The holes are punched in a bird pattern that is well known from the famous Dutch graphic artist Escher. This refers to the many migratory birds crossing this area. 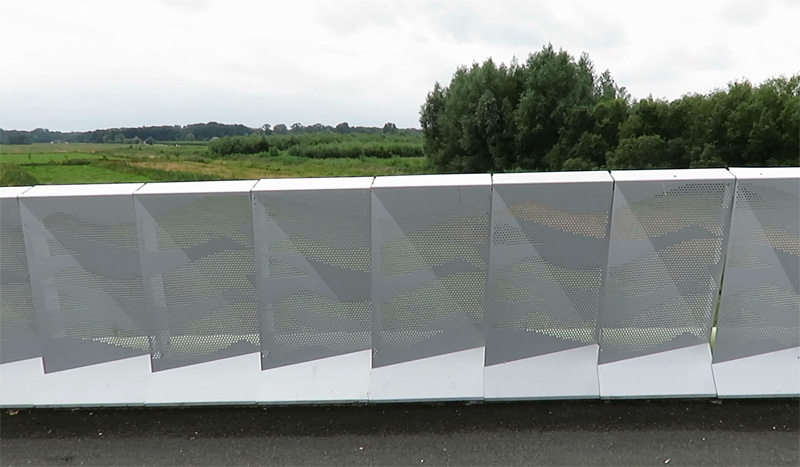 The sides of the bridge are aluminium sheets perforated in a bird pattern. 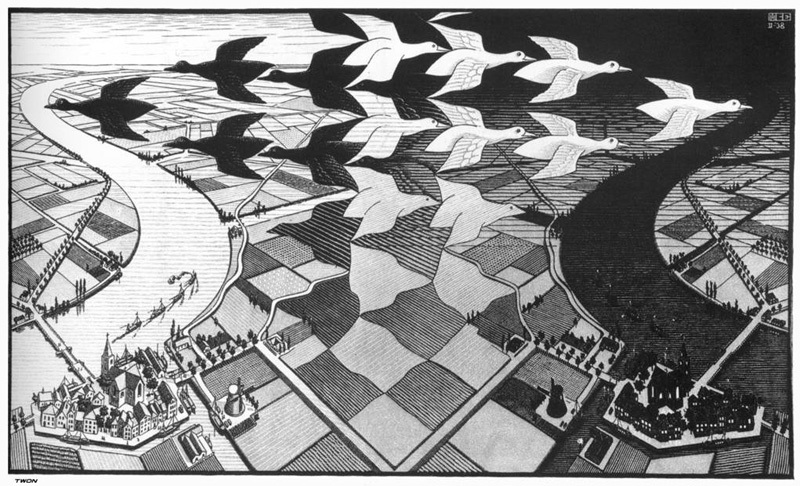 The inspiration for the bird pattern came from this drawing by the famous Dutch artist Escher. The birds merge with the landscape. The bridge was built in a collaboration of many public and private parties. The municipalities of Stichtse Vecht (of which Maarssen is part) and Utrecht, Rijkswaterstaat (the road building agency of the Ministry of Transport), the former Dienst Landelijk gebied (the rural land development agency from the Ministry of Economic Affairs), Natuurmonumenten, a nature conservation organisation, the architect, the engineers and the contractors. 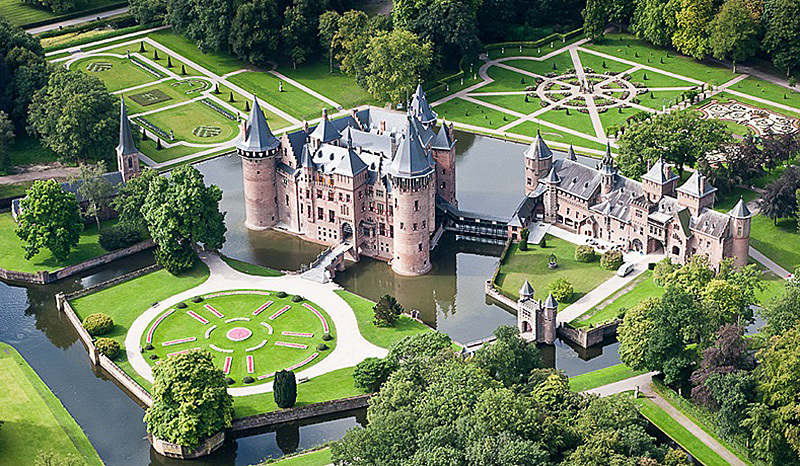 Aerial picture of castle De Haar. Central point of the recreational area that can now be reached more easily by the new cycle bridge. The total length of the bridge including the entrance ramps is about 450 metres. The steel frame construction was assembled near the site and the entire main span of 91 metres long was placed on a combined steel and concrete base in one night in December 2011. The bridge was then finished and opened on 22 June 2012. The bridge was considered the final part of the widening of the motorway. Even though it is a cycle bridge it is strong enough to support emergency vehicles including trucks from the fire brigade. The width of the deck at 5 metres also makes that possible. This means the bridge can even be used in case of emergencies on the motorway. The contractor is Dura Vermeer who entered the bridge for the National Steel Prize competition in 2014. 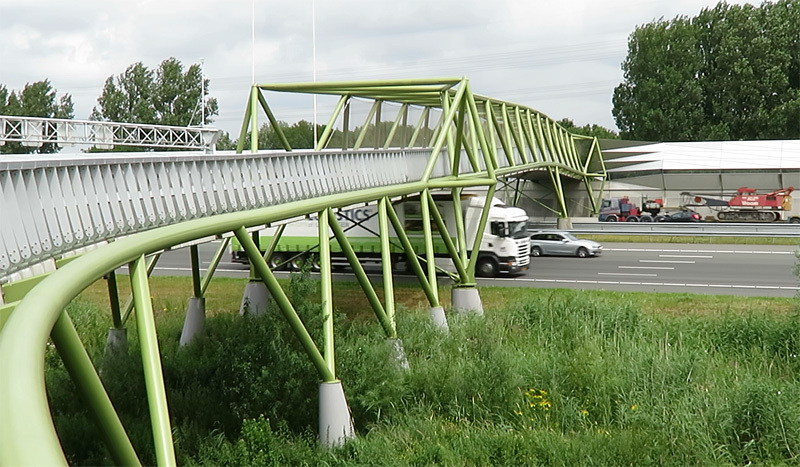 They also built the cycle bridge in Tilburg that I showed you before. The application lists some interesting details. Like that the bridge was designed in such a way that it only needs maintenance to the conservation system once in its expected 50 years life span. The lengths of the entrances are 176 metres on the Maarssen side and 179 metres on the Haarzuilens side. These entrances have a very convenient gradient of just 2.5% for the most part, only in the lowest parts that increases to 4%. The winding entrances give a constantly changing view of the surroundings. Map of the new recreational area around Haarzuilens. 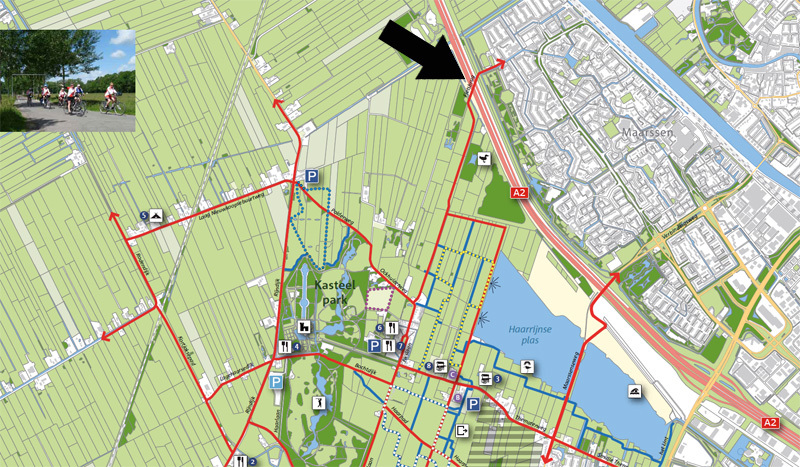 I marked the bridge with an arrow and it is clearly visible that it forms a vital connection between this recreational area and Maarssen to the right of the A2 motorway. 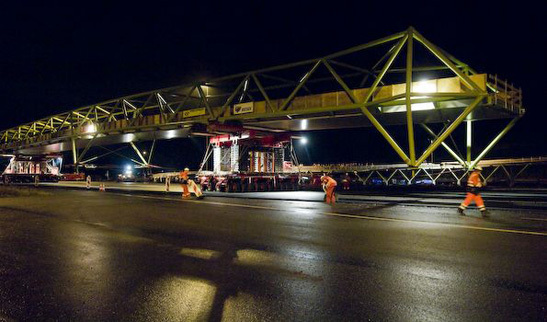 The bridge parts were brought to the site in the maximum transportable length of 20 metres. There these parts were assembled. The main span across the 10 lanes of motor traffic is 91 metres long. It is 7 metres wide. Because its weight is relatively low (440 metric tons for the steel beams and the concrete bridge deck) it could be put in place on trucks. The hydraulic trucks moved it from the assembly location at a height of just above its final height, perfectly level, for 1 kilometre over the new motorway to its final location. All the equipment to transport it and to keep it level weighed another 200 tons, so the trucks had a total load of 640 tons. This entire move was all done in one night. The bridge now rests on three supporting points. It then took another 6 months to finish the bridge. This recreational bridge is one of many built in recent years in this country to decrease the number of barriers. The cycling network still has many missing links. Most of the easy solutions to fill in the gaps have been built earlier, the remaining ones often require large infrastructural works like this bridge. But it is done nonetheless, because getting rid of barriers increases the number of areas that are easily reached by bicycle and thus it makes cycling more convenient. When cycling is more convenient more people do it and that in turn is beneficial to people themselves and to the entire society. I could be imagining it but the Netherlands seem fairly windy watching these great videos.That is looking at the plants swaying.I say this cause I was thinking how it would be nice to put up a few wind turbines around the bridge. Then you could store wind energy in battery storage.Use that energy to power lights and a heated mat layed down on the tarmac.Lighting and no snow and ice. Lastly the funds for this could be from public donations. It’s mildly troubling to note standing water on a new bridge deck. Of course, rain could have ceased mere minutes before the video was shot, but if not, then the obvious conclusion is that during winter months those areas will be/become ice patches. Well it had rained all morning so that is indeed the cause. It’s not okay though on a three year old bridge. On top of that, this is a recreational bridge so the bridge won’t be cleared of snow and ice anyway. Hey Mark, I would try using emergencies rather than calamities when you were talking about the bridge being able to support emergency vehicles like firetrucks. It is what is usually used in English, which we all know by now is not your first language. Do you know somewhere that focuses on how Dutch roads for cars and motorways and how signalized intersections are implemented? It would be good for me to know because I am trying to make the ideas I present to my city and province more attractive by highlighting that Dutch roads are not absolutely anti car and the Dutch have intricate systems for making cars an option to people too. That way people have genuine choice but making cycling and public transport the fastest option. Thanks, I corrected that translated Dutch. I think there must be a page on SkyScrapercity about the roads in The Netherlands. I think Keokiracer would know. You are right of course, I even knew that from experience. I was confused by one of my sources. Fact is that the bridge was a compensation for the 5th lane. That appeared in the last instance in the 2008-2011 widening project. So that must mean that that project had initially only be planned for 2×4 lanes. So I updated the text. Do you know if there is a page in English on roads in the Netherlands on SkyScraperCity? 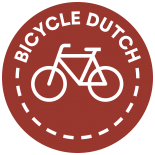 This entry was posted on 1 September 2015 by Bicycle Dutch in Original posts and tagged big bridge, bridge, Haarzuilens, Maarssen, recreational cycling.